The Medina of Marrakesh is an old Islamic capital originating from the 11th century. It is enclosed by 16km of ramparts and gates. The city owes its original splendour to the Almoravide and Almohade dynasties (11th - 13th centuries), who made Marrakech into their capital. Beyond the walls, Marrakech has ample areas of greenery at the Palmeira palm groves, and the Menara and Agdal gardens. I cannot count the number of times that I lost my way in Marrakech. And not only in the maze of the souks. Not one map seems to be able to properly display this organically grown city on paper. Especially finding the Ben Youssef madrassa proved to be too complicated for my orientation skills. Approaching from either the south or the north, I always ended up somewhere amidst the shops of the souks. Fortunately, Marrakech has plenty of things to see so you'll end up at an interesting place anyway. 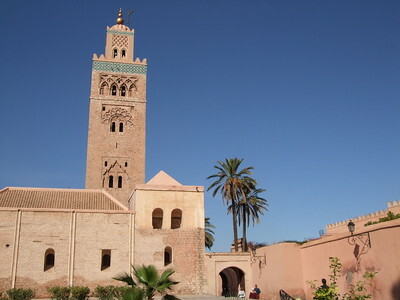 Its main landmark is the minaret of the Koutoubia mosque. It dates from the 12th century but looks as if it was built yesterday (probably because of the restoration it has undergone in the 1990s). It never stops to draw one's attention, from whichever side you approach it. A major sight, that could have gotten WH status on its own merits. More hidden from first sight are the palaces. The 19th century El Bahia palace for example gets more and more impressive at each courtyard. Especially the woodwork in the ceilings and around the doors is amazing. I was also struck by the number of tourists at the site - easily hundreds. This is December, this is Southern Morocco, and whole European families had turned this once remote and mysterious caravanserai city into their holiday break. More of that was to come at the Saadian Tombs. A snake-shaped queue had formed at the inner courtyard. The people in it were all waiting for a glimpse of what must be the most amazing tomb of them all. I had to wait about half an hour before it was my time to have a peek. It proved worth queuing for: from floor to ceiling this whole room is covered with motifs. Mosaics on the floor, Italian marble tombs, curly stone carvings at the walls, gilded archways and an elaborate wooden ceiling. What a place to be buried! Two full days proved to be too short to see all of Marrakech. I even tried to do it fast forward, by using the Hop on Hop off-bus. That way I did cross the Palmeraie, but had to skip the Menara gardens, the El Badi palace and the Musée de Marrakech. I walked and walked until my feet got sore, and I still hadn't seen all I had wanted. I love this city - although I can't decide whether I prefer Marrakech or Fez. Oh well, no reason why you can't just enjoy both for different reasons! The constant hassling of tourists for everything in Marrakech become a little annoying but you get used to it quite quickly and there are ways to minimise the trouble. Away from the souks and the hotels there are lots of great sights that make up the WHS. El Bahia Palace is one of the more impressive, but even the ruins in El Badi Palace have their own charm. There are lots of ways you can approach a visit to Marrakech. I stayed for about three days and did a good mix of sights, getting lost, and just relaxing in the cafes. Travelling by train from Casablanca airport to Marrakesh, I soon found myself at Bab Doukkala and the entrance to the medina. Besides nearby the palacial riad that I was staying in, I was immediately besieged by the sounds, smells, sights and tastes of the souk. Here were stalls selling brochettes, tangerines, dates, live chickens, flat bread, ceramics and a thousand other necessities of life. Over the next few days I explored this city, seeking out huge and decorated palaces, tiny synagogues and a massive Jewish cemetery. We went to the medina in Marrakesh in March this year. I found it far less threatening than the medina in Fes. There is more room to move around and you are not getting almost run over by mules all the time. The people are friendly, however be careful not to be conned into buying items that you don't really want. The stall owners can be very pushy and all will tell you that their goods are unique, however you can often find the same item around the corner and often cheaper. Haggling over prices is expected so don't pay the asking price unless you are totally happy that it is already a bargain.Do be careful where you eat, look at the food and then look at the cafe/restaurant, is it clean does the food look fresh. Be careful of the monkeys, they are trained to steal off you if they can while they look cute they are cunning and sometimes can scratch or bite and that will only lead to severe medical problems. Over-all we had a good day in the medina but did find that the further you went in the less variety there was as everything was the same. If you want to see as much as possible then start early (they open about 10am) and take some food and water with you, the stores don't close until about sundown so you should have plenty of time BUT do take note of which way you are going, it is like being in a rabbit burrow. Be mindful of those around you and hold on tight to your belongings,one last thing...those anying people that follow you around and try to sell you there goods...don't look at them and just keep on walking, this worked for me others in our group tried to argue with them and this only leads to you wishing you simply had shut up and kept walking. They will argue with you and follow you for ages, I witness one fellow follow a man in our group for over five minutes. This is an experience that will stay with you forever, if you have the chance then you simply should not miss it. I visited this WHS in June 2011. Marrakesh is home to several impressive monuments such as the Koutoubiya Mosque, the Kasbah, the Badi' Palace, the Ben Youssef Madrasa and the Saadian Tombs. However, the highlight of my visit was the Place Jama' El Fna, inscribed in the UNESCO Representative List of the Intangible Cultural Heritage of Humanity. I was there in 1974. It was a surreal experience for me, saw many things that I had seen in photos long ago in Life Magazine...sort of sent chills through my body. Compared to other cities in Morocco, it is an adventure you will never forget. I stayed there for about a week, living cheap in the medina, eating cheap at a cafe in the medina...good idea to eat where other vagabonds eat, I never got sick. The Plaza Djemma el Fna was good to see, but once you walk through the entrance to the medina, you've entered a world as different as you'll ever find anywhere in the world. The merchants are like anywhere, want you to buy everything, wonder why you don't, will ship it for you anywhere you want....I didn't, there is no recourse if they don't. What are you goin to do, fly back and complain? But, everything you see is about a good as it gets, you could furnish a palace with what you'll see. I got there via a bus from Fez, a terrible city. Avoid it if you can, the Moroccans are so uptight there. I was a vagabond back then, hitched across N. Africa, Tunisia, Algeria, and Morocco. If you are really adventurous, go to Essouira, stay there for awhile, live in the medina. Another unforgettable experience. And you can enjoy the ocean as well. Marrakech with a Berber heritage and one of the original travel meccas, is a vibrant mix of past and present. 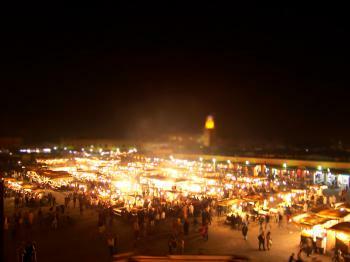 The Djema El Fna is an ancient meeting place where caravans crossing the sahara with slaves and trade goods met. The city has had a violent past but its historical monuments have been largely spared. The impressive Koutoubia mosque and minaret overlooks the the main square and the vast living medina or old city. 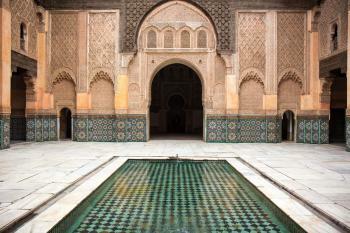 The Ben Youssef Madrassa (university) is exquisite! Built during Islams golden age, it is a glorious testament to the artisans and architects of the Merinid Dynasty based out of Fez. The Merinid Sultan Abu Inan Faris in the 14 century became the patron to the great world traveller Ibn Battuta who studied in the great madrassas of Fez and Marrakech. The Djema el fna remains a strange place where fortune tellers, snake charmers, entertainers, story tellers (not in english) , healers, musicians, local families and foreigners congregate nightly. At night is the unforgettable night market serving exquisite cous cous. tagines (stews). grilled lamb chops or brochettes (skewered meats). fish, salads, and much more. 1000's of locals and visitors fill the dozens of eateries set up each night. it's a raucous affair with all having a great time. The vast medina is open late selling anything though the marrakech slave market is closed; it now sells carpets. One can get seriously lost in the medina. Its creepy at night. 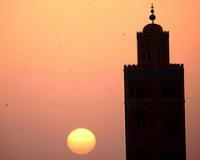 Marrakech is a great medieval city that retains its exotic nature with a cosmopolitan european modernity. The medina here is no preserved museum it is busy, dirty and noisy and it is here that it’s massive charm can be found. The whole place feels completely alive, especially the main square Djema-El-Fna. This was the highlight of the city for me; it was so busy and on the whole it seemed that the entertainment was directed at the locals and not at the tourists. It was fascinating to see this happen, and at night (picture) it turns into a huge open air restaurant, unfortunately a bout of travellers stomach, picked up elsewhere, stopped us on our last night from giving the food a try but our travelling companions ate their and really enjoyed it. The square is not much to look at, however it is really a great place to experience, and you will be hard pressed to find a better bargain than the freshly squeezed juice for 3dh (€0.30) at many of the stalls. The alleys leading north from Djema-El-Fna are the souqs and are really the central aspect of the city. Marakesh is a real trading city as a destination of the caravans arriving from the Sahara; this is shown by many of the wares on sale from Berber, Toureg and even Dogon communities. The things that are not brought in from the dessert are made with-in the city; it is great to see production happening on such a human scale. You can see the things for sale being handcrafted in stalls and courtyards all through the souqs, it is great to know that they are not just cheap imitations imported from the far east. (A quick note in reply to Paul Tanner’s review of Fez, you may be happy to know that the art of turning old car tyre’s into slippers and decorations is still alive and well here). I think the souqs were where I had the most fun, I really quite enjoy bartering and I did plenty of that here. Although the highlights of Marrakesh are the human activities, it also possess’ some great sights as well, the minaret of the Katoubia Mosque is a real symbol of the city. The Ben Youssef Medersa is one of the few religious buildings open to non-Muslims and is well worth a visit, the decoration with Quranic script is brilliant. The Saadian Tombs and remains of Palace El Badi are also worthy excursions into the Kasbah. Marrakesh is a fantastic city that buzzes with life, and unlike many other destinations it is not solely for the entertainment of tourists, it is the way that the people of the city live and have lived since its founding. A real gem and worth a weekend of any ones time. medina of marrakesh is for me one the most peaceful on in all morocco. full of berber people imigrated from the after atlas villages south morocco. main square j'ma el fna sure is the staring point of the imense labirinth of the huge medina of marrakesh. from tapestry, food, local clothes and shoes, islamic items,books (theres even a astore called "FNAC BERBER" funny!!) jewely, handicraft of all sorts. everything can actually be found over there. 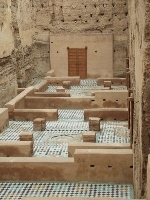 the old medina helds the museum of marrakesh. be careful during sunset time. take enough time to see some stores, get lost, talk to people and get out of medina before full dark night comes. may be hard, maybe not...never been there to check, but somefriends born in marrakesh told me they don't go there. near the old medina and the market square: cutubia mosque. huge mesquita with astonishing calling tower. in the square restaurantes may have dangerous food. it's normal to et some stomach sixkness after some dinner in j'ma el fna. personally i never was sick. i always go to restaurant number one called aicha, named after the cooks name, fat lady, bossy and very very nice always smiling. in the morning instead of drinking orange juice in the hotel, try to go to the ones on the main sqaure also.number 6 is my favorite. hope you have great time in marakesh. Notable Hotels: Hotel La Mamounia. Famous for its guests (inc Churchill/Roosevelt whilst at Casablanca) and art deco/moorish designs from 1922. Terrorist Attacks: Djemaa el-Fna square, April 28 2011. Suicide bombing, 16 dead. Almohads: Koutoubia Mosque " The minaret was completed under the reign of the Almoahd Caliph Yaqub al-Mansur (1184-1199)"